Kusatsu-Shirane (Honshu): An unexpected, relatively intense but short-lived explosive eruption occurred yesterday at the volcano, which is home to a popular ski resort. Tragically, the eruption triggered an avalanche that killed one person and ballistic projectiles wounded several others who were near the vent at the time of the explosion. With apparently no precursors, the eruption started shortly before 10 am from a vent in the valley between the young cinder cones of Aino Mine and the twin cone of Motoshirane San, both in the saddle south of the main summit cone. One of the ski lifts and runways pass very close to the vent. Numerous skiers were only few hundreds meters away when the activity started to eject strong, vertical jets of steam mixed with ash and debris that rose a few 100 meters and sent blocks to up to 250 m distance. 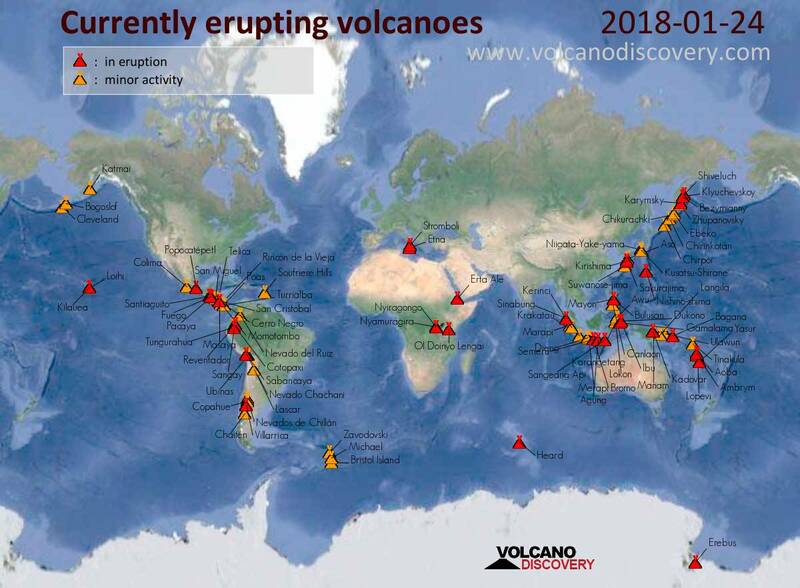 Kadovar (Northeast of New Guinea): Volcanic Ash Advisory Center Darwin (VAAC) issued the following report: EMISSIONS LAST OBS EXT ESE AT 24/0540Z. Volcanic Ash Advisory Center Darwin (VAAC) issued the following report: EMISSIONS LAST OBS EXT NE AT 23/2320Z. Sinabung (Sumatra, Indonesia): (24 Jan) Volcanic Ash Advisory Center Darwin (VAAC) issued the following report: ERUPTION REPORTED TO FL110 MOV E AT 24/0731Z. Dukono (Halmahera): Volcanic Ash Advisory Center Darwin (VAAC) issued the following report: CONTINUOUS VA PLUME TO FL050 OBS EXT ENE. Volcanic Ash Advisory Center Darwin (VAAC) issued the following report: CONTINUOUS VA PLUME TO FL060 OBS EXT E.
Agung (Bali): Volcanic Ash Advisory Center Darwin (VAAC) issued the following report: ERUPTION REPORTED TO FL140 MOV ENE AT 24/1437Z.